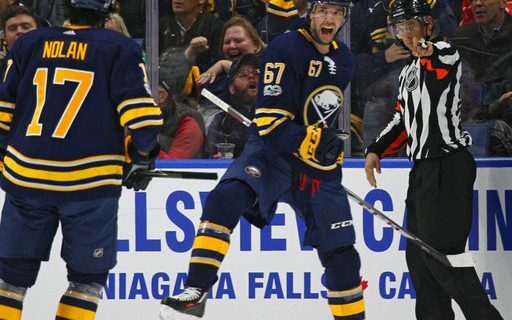 The Buffalo Sabres and Detroit Red Wings played a game on Tuesday night that didn’t earn many style points. It was tough, mostly defensive hockey in which good scoring opportunities weren’t exactly common. Newcomers to the game won’t be racing back to the KeyBank Center to buy tickets for more of the same. But beauty, as the cliché goes, is in the eye of the beholder. The Sabres came away with a 1-0 victory that represented good news on a number of levels. The immediate one was that it was the first win at home this season. OK, it had only been three games, but two of them had been clunkers. You don’t want such things to fester for very long -certainly not past Halloween . What’s more, the game gave the Sabres a two-game winning streak, the first time that’s happened this season. A 3-5-2 record sounds a great deal better than 1-5-2, which is where the team was after Friday night’s loss to Vancouver. The twin wins should calm the fanbase a bit. “We took responsibility, and played the way we wanted to play,” Benoit Pouliot said. Speaking of Pouliot, the Sabres have been looking for forwards who can do some consistent damage on the top two lines. Pouliot now has scored in two straight games. It’s not much, but you have to start somewhere. This latest goal was an innocent-looking one. Victor Antipin threw the puck at the net, Pouliot grabbed the rebound, and essentially beat Detroit goalie Jimmy Howard to the far post as the forward tucked it home. “I was trying to wrap it around, make it as quick as I could,” Pouliot said. The goal came at almost the halfway point of the game. All the Sabres had to do was keep the Red Wings off the scoreboard for 30 minutes, and they did that. There were a couple of close calls but for the most part the Red Wings couldn’t get much going. When they did, goalie Robin Lehner had an answer, as he recorded his first shutout since a February win against Colorado. “We played a good game; we played the right way,” Lehner said. As you’d expect the shutout did wonders for Lehner’s save percentage. It jumped almost 20 points and moved well above the .900 mark for the young season. The Red Wings did have a couple of good chances with the goalie pulled in the final two minutes. That’s going to happen, but after getting through a couple of nervous moments the Sabres did what was necessary to preserve the win. One last bit of good news – the Sabres jumped past two division rivals, Boston and Florida, by getting up to eight points on the young season. It’s never too soon to keep an eye on the standings. Buffalo will play the Blue Jackets in Columbus on Wednesday night. It’s back home on Saturday afternoon for a game with San Jose.